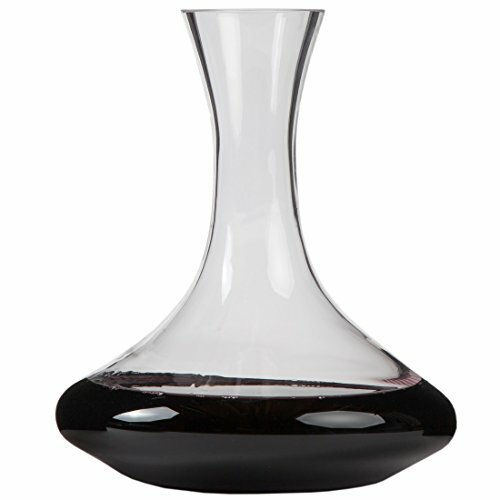 Display and aerate red wine in this gorgeous decanter. This curvy decanter looks elegant on any tabletop or bar, and beautifully displays red wines, upping the anticipation as you await your first glass. The wide base is specially designed to allow the wine to aerate over a large surface area for faster, more efficient aeration. Slowly pour your wine into the decanter, taking care to keep a majority of the sediment in the bottle for a smoother, cleaner pour. Allow wine to rest in the decanter for five minutes to two hours. Excellent for high tannin wines, helps soften bitter flavors. Upgrades cheap wine and brings out deep, rich flavors in high end red wine. BRINGS OUT DEEP FLAVORS. Allowing your wine to aerate in this beautiful decanter brings out deep, fruity flavors in even your blandest vino. WIDE BASE FOR EVEN AERATION. The unique, bowed base distributes the wine over a greater surface area for full, even aeration. HOLDS 47 OUNCES. Large capacity holds nearly 2 bottles. Flat base, narrow neck. Dimensions: 10 inches tall, 9-inch at widest diameter. FOR HIGH TANNIN WINES. Helps mellow bitter wines. Makes cheap wine taste better, and brings out the best flavors in your cherished vintages. REDUCES SEDIMENT. Pour wine in slowly so sediment settles to the bottom of the bottle, not in your glass.